According to Al-Ghazali, “knowledge exists potentially in the human soul like the seed in the soil; by learning the potential becomes actual.” After-school Quran & Islamic studies programs have been a vital part of Muslim education throughout history. To preserve and protect the faith of our children and give them the opportunity to learn the essentials of Quran recitation, memorize, and Islamic education, thus training them to be our next generation of leaders of our Ummah. The BEST alternative to full time Islamic school. Boys/Girls ages 5-11 (Children age 4 will be consideration if seats available and child passes evaluation). Enrollment is accepted all year round. Provide a fun, interactive Islamic learning environment, enabling the child to flourish based on his/her capabilities and personality. Develop proper character (Tarbiyah) for the child. Enable the student to recite and memorize the Quran, utilizing traditional methods paired with modern technology. Help build the child’s Muslim identity. Tajweed rules will be taught. 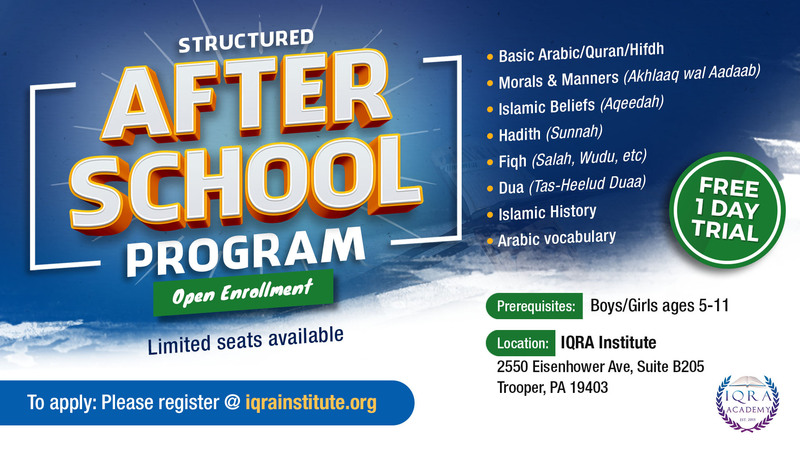 By completing this program in its entirety, the student shall have a strong grasp on reading the Quran, have memorized the 30th Juz’ plus selected Surah’s in the Quraan set by the Hifdh curriculum, memorized Dua, as well as Islamic fundamental knowledge, including salat, Islamic history, Islamic etiquette, and basic Fiqh. Tuition: $150/month. 10% Discount given for each additional sibling(s). Class days/times: M, W, Th – 5:30 PM – 7:30 PM. Check out our Teachers page to read more about our Academy teachers! Fill out below form to claim your FREE trial or to enroll today! “My children have been attending Iqra Academy for five months now, and I have already started to notice a significant difference in them. As a mother I struggle to give them a clear understanding of Islam that will allow them to accept and love their religion in a country where Muslims are a minority. Iqra Academy helped me do that. It brought me great joy when my nine year old daughter, who used to always worry about wearing the head scarf (hijab) and refused to wear concealing clothes, asked me to buy her a hijab so she can be ready to wear it when she decides to. My seven and six year old sons, who used to complain about getting up to pray, now hurry to pray with us even if they are tired and in bed.